John Moses Browning developed the 45 ACP or Automatic Colt Pistol round as a top of the line automatic handgun cartridge. 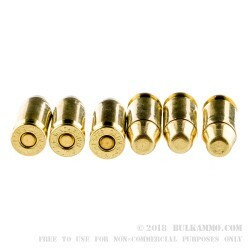 It has graced multiple handguns since its design in 1905, and has seen numerous bullet types, multiple bullet weights, and is still in extremely wide usage today. There are also many different variations on the market too, including 45 Auto Rim, 45 GAP, 45 ACP+P, and 45 Super. 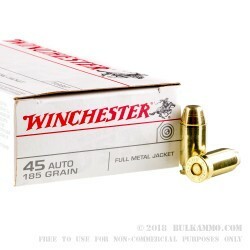 The Winchester 185 grain Full Metal Jacket rounds are made in the USA, have a complete brass jacketed lead core bullet, and they are loaded into a highly polished, heavy wall, reloadable, Boxer primed brass case. These have a muzzle velocity of 910-feet per second or subsonic power, and a muzzle energy of 340-foot pounds. 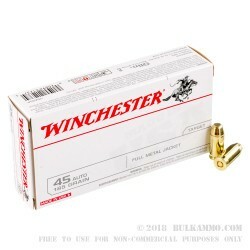 They are packed in the famous Winchester White Box, in 50 round packs that are ready for you to take them to the range with you. Get yourself multiple boxes so you can take the entire family out for a day with your 1911s. 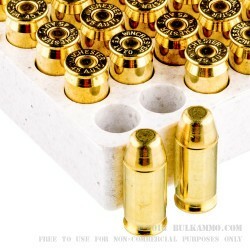 Stock up on .45 ACP for your armory today.